No cash for coffee? No problem. Pay with a poem. 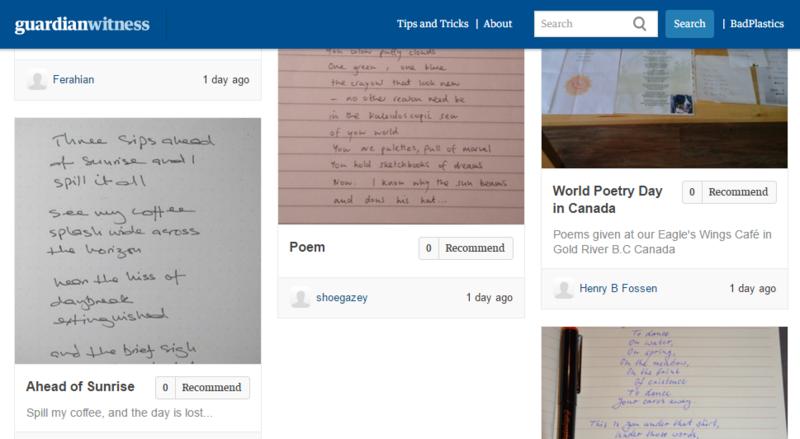 Handwritten poems submitted to Guardian Wtiness, including one of my own. The idea of being able to hand over a poem for your next cup of coffee sounds a little crazy. But you could have done exactly that on March 21st, which was World Poetry Day. Over 1,280 coffee outlets around the world participated and handed out coffee in exchange for a poem. I first heard about it while reading the Guardian newspaper. At the end of their article they invited readers to submit their own poems – not in exchange for anything this time, but just for fun. There’s something beautiful about paying for stuff with a poem. Maybe I could write a longer poem for a coffee plus a muffin or sandwich. Or a book of poetry in exchange for a weekend away at a nice hotel. What’s so appealing about this idea is that normally a poet can expect absolutely nothing in exchange for all their hard work. A book of poems has never, to my knowledge, hit the New York Times bestseller list. There is no money in poetry. You write it because you want to, or feel compelled to. There is no reward other than the writing of the poem, or having someone read it. To be able to exchange your work for coffee is a wonderful thing. And it’s no bad thing for the coffee shop either. Many of the participating shops found a place to pin up the poems for all their customers to enjoy. Suddenly they had the opportunity to create an art installation that would attract more and more people to their shop. Maybe similar campaigns can be created for people who want to pay for their coffees with a sketch, a small painting or even a good joke written on the back of a bus ticket. Art, in my view, is horrible under-appreciated in most parts of the world. I, for one, wouldn’t say no to paying down my mortgage with a few good poems.